Honest Tea, the organic beverage brand acquired by Coca-Cola last year, recently launched an advertising campaign that acknowledges responsibility for its discarded drink containers contributing to the waste problem and encourages consumers to recycle. The New York Times reported on the company’s eco-minded campaign featuring a grand-scale ‘Great Recycle’ event starting on April 30. The company’s ‘Great Recycle’ event is just one component of an advertising campaign that will include online, social media, broadcast, and outdoor advertising. The event will launch in Times Square with a 30-foot-tall recycle bin that will travel on to other cities. Over a 10-hour period, recyclers will be able to climb onto a stage to throw recyclable containers into the huge bin. Honest Tea employees will also pedal a bicycle-powered conveyor belt that will transport additional bottles and cans into the bin. Those who participate will be able to earn a rewards point for each recycled container and add points by making a recycling pledge on stage. These points can be claimed for Honest Tea beverages and T-shirts, along with yoga mats, skateboards, and tickets to concerts and Broadway shows. The goal of the initiative is to recycle 45,000 beverage containers, which is the number of beverages that the brand sells each day in New York City. The company chose to launch its ‘Great Recycle’ event in New York because it’s their largest market, as well as to show support for Mayor Bloomberg’s push to double recycling in the city by 2017. For people who cannot attend the Times Square event, the company is promoting recycling using social media and its new website, Thegreatrecycle.com. Visitors to the site can recycle an old Facebook status message in exchange for points that can be redeemed at Recyclebank.com for discounts and products at more than 3,000 businesses, stores, and restaurants. In addition, the company has set up a Twitter hashtag, #GreatRecycle, which will be displayed on the oversized recycle bin and on fliers distributed throughout the city. The company is also using Facebook ads to generate interest. For the broadcast component of the campaign, a 60-second video was created that features silent imagery of one bottle’s path to being recycled. 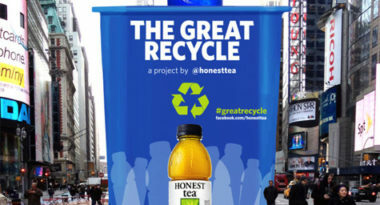 The video can be viewed on HonestTea.com and at Thegreatrecycle.com. The advertising campaign is an extension of the company’s original recycling efforts at its headquarters in Bethesda, Maryland. Efforts have included placing 30 recycling bins on city streets and providing bins to music festivals. The recyclable containers collected during the upcoming ‘The Great Recycle’ event will be transformed into urban gardening supplies for public schools. “We want people to be aware and make a commitment,” Mr. Goldman added. To discover the latest ways to use eco-minded campaigns to capture your audience’s attention, contact MDG Advertising today at 561-338-7797, or visit mdgadvertising.com.